Russian bombers in Venezuela amid tension with U.S.
(CNN) -- Two Russian bombers have landed at a Venezuelan airfield where they will carry out training flights for several days, the Russian defense ministry said Wednesday. 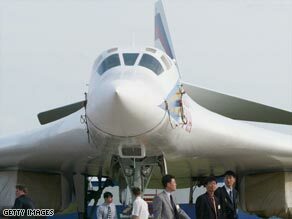 Russia's Tupolev TU-160, pictured here in 2003, is a long-range strategic bomber. The Tupolev Tu-160 strategic bombers landed at Venezuela's Libertador military airfield and "will spend several days carrying out training flights over neutral waters, after which they will return to the base," the ministry added. NATO fighters followed the bombers on their 13-hour flight over the Arctic Ocean and the Atlantic, the defense ministry said. It said the Russian flights were carried out in strict accordance with international rules governing airspace above neutral waters, and that the aircraft did not violate the borders of other states. Pentagon spokesman Bryan Whitman said such joint exercises between nations are not unusual. "We exercise all around the globe and have joint exercises with countries all over the world. So do many other nations." The U.S. will monitor the Russian-Venezuelan training, said Pentagon officials who asked not to be identified as they are not authorized to speak on the information. On Monday, Russia announced it might hold joint naval maneuvers with Venezuela in the Caribbean. The declaration came amid increased tension between Russia and the United States over Russia's invasion last month of the former Soviet republic of Georgia, a U.S. ally that aspires to join NATO. On Monday Russia denied any link between that announcement and the conflict in Georgia, although Russia has criticized U.S. support for Georgia. Russia has also objected to the missile defense system agreement, signed between the United States and Poland and the Czech Republic in August, that places a ground-based ballistic defense facility in the two eastern European nations. Russia has said the deal threatens its security, while the United States has said that the system is to guard against rogue states such as Iran. Earlier this month, Venezuelan President Hugo Chavez, whose comments have frequently antagonized Washington, said it would welcome the Russian air force, according to Russian news agency Novosti. "If Russian long-range bombers should need to land in Venezuela, we would not object to that either. We will also welcome them," Chavez said on September 1, according to Novosti.